FILE - A nurse prepares an emergency test to diagnose dengue at a medical care unit in the Sao Sebastiao neighborhood of Brasilia, Brazil, Feb. 19, 2016. Researchers are on the cusp of a commercially available vaccine to prevent dengue fever, a viral disease spread by mosquitoes that threatens half of the world’s population. In addition, a vaccine against the Zika virus, a close relative of dengue, will most likely enter clinical trials this year. The dengue virus infects an estimated 400 million people in 120 countries each year. While the symptoms, including a rash, are usually not serious, the disease nonetheless kills some 25,000 people annually. Most succumb to a dreaded hemorrhagic form of the disease. In a clinical trial, the new vaccine against the dengue virus, for now called TV003, was 100 percent effective in preventing the disease in a study involving 50 volunteers. Twenty-four of the participants who received the experimental vaccine were exposed to the virus and not one became infected. By contrast, all of those in the control group, who were not vaccinated, became infected. “To see that we got 100 percent protection against infection gives us great confidence in moving forward that the vaccine is going to work. So we were extremely excited,” said Anna Durbin, an infectious-disease specialist at Johns Hopkins University’s Bloomberg School of Public Health in Baltimore, Maryland. She was a principal investigator. There are four versions of dengue. Symptoms become more severe each time a person is infected. So a vaccine has to protect against all four types. 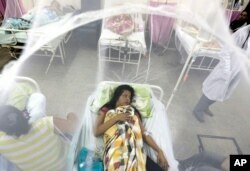 Enclosed in a mosquito net, Nadia Gonzalez recovers from a bout of dengue fever at a hospital in Luque, Paraguay, Feb. 5, 2016. There is already a dengue vaccine called Dengvaxia. While it raises protective immune system antibodies against dengue, people still get sick. TV003 successfully shielded those involved in the study against a mild strain of dengue 2, the most aggressive of all the disease types. TV003 requires only a single dose compared with multiple shots of Dengvaxia. A five-year clinical trial involving 17,000 people in Brazil is in the works. But Durbin said there would probably be enough data by 2018 to seek regulatory approval. Clinical trials are also expected to begin in September or October of a vaccine against the Zika virus, an emerging threat also spread by mosquitoes. It has been linked to brain defects in newborns, and also to the paralytic disease Guillain-Barre syndrome. Efforts to fight Zika could also help the fight against dengue. NIH scientists developed the successful dengue vaccine that researchers reported upon in the journal Science Translational Medicine. Durbin said the aim is to give the dengue vaccine to children before they become infected for the first time. Any Zika vaccine would likely be targeted to women of childbearing age as a way to combat any potential birth defects associated with the disease.